Eyes for Reference, 2018. Ink on paper. 10 x 10 inches. Just a Framework (1/2), 2018. Ink on paper. 10 x 10 inches. Just A Framework (2/2), 2018. Ink on paper. 10 x 10 inches. Dream Journal/Evidence, 2018. Ink on paper. 10 x 10 inches. 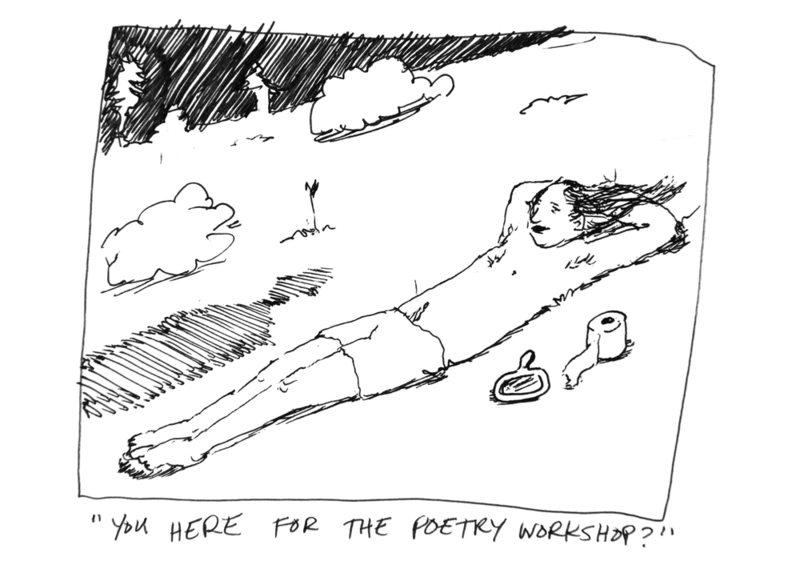 Poetry Workshop, 2017. Ink on paper. 10 x 10 inches. Bird Trash Can Abuse Log, 2018. Ink on paper. 10 x 10 inches. Kids Going to School (1), 2018. Ink on paper. 10 x 10 inches. Kids Going To School (2), 2018. Ink on paper. 10 x 10 inches. Feminist Poodle, 2017. Ink on paper. 10 x 10 inches. Let's Run Away Together, 2017. Ink on paper. 10 x 10 inches. Selfie With Bag of Rats, 2017. Ink on paper. 10 x 10 inches. Set Life, 2017. Ink on paper. 10 x 10 inches. Or Something, 2017. Ink on paper. 10 x 10 inches. Meeting Roseanne Barr, 2016. Ink on paper. 10 x 10 inches. Little Earthquakes, 2016. Ink on paper. 10 x 10 inches. Bassist's Passive Night Out, 2016. Ink on paper. 10 x 10 inches. When Old Friends Show Up At Your House And Judge You, 2016. Ink on paper. 10 x 10 inches. Sailor Bear Gets His Day In Court, 2016. Ink on paper. 10 x 10 inches. Dog And Roses, 2016. Ink on paper. 10 x 10 inches. Bulletin Board of Overheard and Lost Thoughts, 2016. Ink on paper. 10 x 10 inches. Batman and Ticonderoga, 2016. Ink on paper. 10 x 10 inches. Xing, 2016. Pencil on paper. 9 x 12 inches.